Private sector credit growth decelerated gradually to 20.4% in March 2017 and 20.0% in April 2017. The Earlier tightening of monetary policy by central bank and resultant increase in interest rates impacted the credit growth. Despite improved export performance, a sustained increase in import expenditure resulted in a trade deficit of 3.3Bn till April 2017. 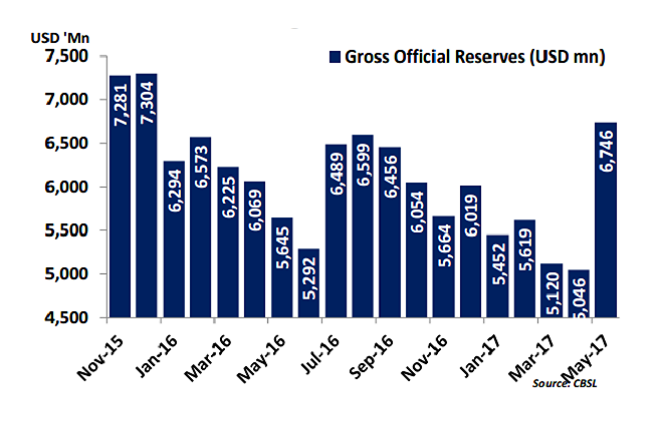 Gross official reserves improved to above USD 7.0 Bn by mid-June from 5.1Bn by end April 2017. Both the government securities market and the Colombo Stock Exchange experienced foreign inflows in recent months. Sri Lankan stocks edged down on Tuesday from its 18-month closing high hit in the previous session as investors booked profits in blue chips, while concerns over a proposed tax bill weighed on overall sentiment. The Colombo stock index ended 0.15 percent weaker at 6,748.15, slipping from its highest close since Jan 7, 2016 hit on Monday. “The index is down on profit-taking, but the good thing is that retail participation has increased,” said Dimantha Mathew, head of research, First Capital Holdings PLC. Foreign investors net bought 42.3 million rupees ($275,391) worth of shares on Tuesday, extending their year-to-date net inflows to 22.9 billion rupees worth of equities. Analysts said new foreign investors have been buying Sri Lankan shares since the Pakistani bourse was upgraded to emerging market status from frontier market. The day’s turnover was 559.7 million rupees, less than this year’s daily average of 912.7 million rupees. In May, index provider MSCI announced changes to its indexes as a result of its semi-annual market reclassification, including reclassifying Pakistan as an emerging market from frontier market, and the addition of 57 securities and removal of 28 securities from its All-Country World Index . Brokers said local investors have been waiting for some clarity on a proposed inland revenue legislation, which a few companies expect will result in higher costs of production. Shares of Ceylon Tea Services Plc dived 13.4 percent, Melstacorp Ltd ended 1.8 percent weaker, while conglomerate John Keells Holdings Plc closed 0.2 percent lower.